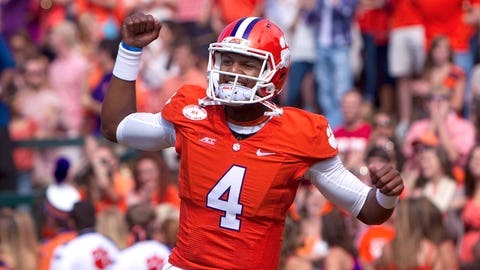 This Saturday Deshaun Watson (above) and the No. 6 Clemson Tigers will host the Georgia Tech Yellow Jackets. Fire meets ice this weekend when No. 6 Clemson hosts Georgia Tech in a matchup of two ACC teams that are heading in polar opposite directions. The Tigers (4-0, 1-0) are fresh off a 24-22 victory over then-ranked No. 6 Notre Dame and enter Saturday’s contest as one of the hottest teams in the country. Led by quarterback Deshaun Watson, whose nine touchdown passes leads the ACC, Clemson is red-hot right now and shows no signs of cooling off. While it may be tempting for the Tigers to look ahead, Clemson coach Dabo Swinney will have none of that. “Everybody wants to end the season after three or four games. It's so funny to see some of this rhetoric — 'OK, these teams are in,'” Swinney said. “Every weekend is a season of its own. Just look around college football. I don't know who was sixth last week, but where are they now? Saturday’s game was supposed to be an ACC heavyweight battle, but with Georgia Tech (2-3, 0-2) having lost three straight games the contest has lost some of its luster. The Yellow Jackets were ranked as high No. 14 this year, but consective losses to Notre Dame, Duke and North Carolina has swatted them out of the rankings. Heading into the matchup, Swinney urged his team not to overlook Georgia Tech.